When we last saw the Parr clan, parents Bob (voiced by Craig T. Nelson) and Helen (Holly Hunter) were cheering on speedster Dash (Huck Milner) as he raced around the track during a school meet while also trying not to notice as their eldest Violet (Sarah Vowell) attempted to hide her happy embarrassment after being asked out to a movie by a boy she’d been crushing on, Tony (Michael Bird). But before they’re even back in the car to talk about the day’s events the city finds itself under assault by tunneling supervillain Underminer (John Ratzenberger). Leaping into action, Bob morphs into his superheroic alter ego Mr. 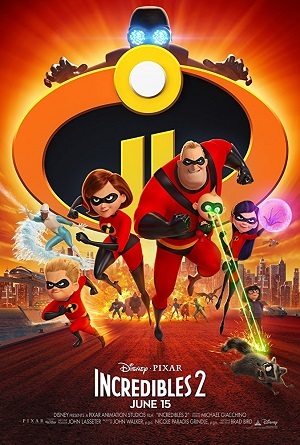 Incredible while Helen puts on the mask of Elastigirl, and after ordering Violet and Dash, both with superpowers of their own, to look after their infant brother Jack-Jack (Eli Fucile) the pair leap into action certain they, along with fellow hero Lucius Best a.k.a. Frozone (Samuel L. Jackson), can save the day. Things unfortunately do not go as planned, and while the Parr family and Frozone do save countless lives, the amount of destruction to city property is substantial. Worse, they didn’t catch the Underminer, their failure to do so forcing each of them back into hiding as authorities let them know in no uncertain terms superheroes using their powers to stop criminals, no matter how good their intentions might be, is still against the law. They could all go to jail, and no matter how unfair this might be the thought she and Bob might land in prison for stopping bad guys leaving Violet, Dash and Jack-Jack parentless is just too ghastly horrible for Helen to even want to think about. Thus begins Incredibles 2, the long-in-coming sequel to Pixar’s 2004 Oscar-winning sensation The Incredibles, the entire Parr clan finding themselves at the center of a brand new adventure as they attempt to make being a superhero legal again while also doing what they can to remain a loving family no matter what obstacles are put in front of them to overcome. In other words, pretty much the same basic side plot as the first film only this time, instead of Bob heading to a mysterious hidden island to secretly help lay the groundwork for superhero rights, this time Helen is the one who gets to put back on the mask and clandestinely battle baddies. This gender flip aside, writer/director Brad Bird is still obsessed with examining the family unit, especially as it pertains to how parents communicate with one another and their children, all of which gives this second visit with the Parrs as emotionally accessible and as intimately affecting a central core as that justifiably lauded first outing also had. If anything, it are these family dynamics where Bird’s sequel excels. The scenes of a tired yet determined Bob trying to figure out how to keep Dash interested and excited about his homework, learning the best way to comfort Violet through her emotional travails involving Tony when he barely understands what’s going on with her while also having his mind blown into itty bitty pieces when he discovers Jack-Jack has an unfathomable litany of powers he’s far too little to be able to fully control, all of that is wonderful. Bird stages these scenes with a knowing confidence that goes beyond a few simplistic jokes or a handful of creatively engaging set pieces. Instead, he digs deeper, discovering universal truths that flip through a handful of emotions with ease, producing a number of laughs, tears, smiles and sighs with remarkable authority. Surprisingly, it’s the Helen/Elastigirl side of the story that feels underdeveloped and ill-defined. She’s convinced to come out of retirement by wealthy tech company scions Winston (Bob Odenkirk) and Evelyn Deavor (Catherine Keener), a brother-sister tag team who just so happen to also be superhero enthusiasts. They want to overturn the law that has kept heroes from utilizing their powers to fight crime, and they feel Elastigirl is the one to see this happen. They’ll show the world just what it is she can do and in the process build up public enthusiasm to repeal the law that makes superheroes illegal, Winston feeling that popular support is all they’ll need to convince politicians to do what they think is the right thing for the world. It’s all perfectly staged, and Bird crafts a couple of show-stopping action sequences that easily put every other comic book or superhero-based action film released this year, including Black Panther, to shame. One involving Elastigirl and a runaway elevated train is astonishing, everything from the animation to the editing to the camerawork to the performances all working in such terrific tandem I never wanted it to end. But the problem is these moments, as superb as they might be, just don’t have anything approaching the same sort of euphoric kick similar sequences in the first film had. More importantly, they rarely engage the emotions, and as impressive and as eye-popping as practically all of them are, I rarely felt anything more than appreciation for the technical skill it took to bring them to life more than I did anything else. I think this has something to do with the core themes rumbling throughout the center of Bird’s script. I’m not entirely certain the filmmaker knows what it is he actually wants to say this time out. Do people have the right to make of their lives what they want to, all obstacles and government shackles be damned? Or should the majority of those residing on the Earth allow a precious chosen few to solve all problems for them? Allowing themselves to be ruled by a powerful elite who supposedly know more about right and wrong than they do? Or is it some in-between utopia Bird is hinting at? Some sort of melding of social, cultural and political ideals that will leave everyone satisfied and content? I have no clue, and I’m pretty sure The Iron Giant and Tomorrowland filmmaker doesn’t know either. In the end, what works about Incredibles 2 is the same thing that worked so brilliantly in The Incredibles, and that are the relationships between each member of the Parr family. Even with their superpowers, these are real people struggling with real problems looking to overcome them together like so many real people living in the real world right now do each and every day. There is sublime joy in watching them learn and grow together as a family, the way in which they can understand and embrace their various differences and idiosyncrasies because they know doing so makes them a stronger unit and allows their bond to grow in strength to the point it becomes nigh unbreakable simply outstanding. I honestly didn’t care if Elastigirl solved the mystery of the hypnotic madman calling himself “The Screenslaver” trying to foil her return to crime fighting. The backstory to why Winston and Evelyn felt it was their duty to help her didn’t interest me, either. But I did care about Helen and Bob’s friendship with Lucius. I was emotionally invested in whether or not Violet was going to be able to look beyond her schoolgirl crush and begin to see her value as a woman and human being went far beyond whether a fellow teenage boy liked her or not. I did want to see Dash prove victorious in his battle to become good at math and I couldn’t wait to discover whether or not Bob would be able to find a way to help Jack-Jack begin to control his blossoming superpowers. Most of all, I couldn’t wait to see the entire Parr clan back fighting against evil side-by-side, using their abilities in tandem as they trusted one another to do the right thing in order for them all to save the day. Together. As a family. As one. Ultimately, Incredibles 2 matters because Bird understands we as an audience are fond of Bob, Helen, Violet, Dash and Jack-Jack because they in turn love one another with selfless transparency. They’re the reason any of this has resonance, the reason we’ve been eagerly longing for a new adventure featuring each of them for over a decade. Even if the storytelling is a little tired, even if all of the themes aren’t nearly as clear or as direct as they were in the first film, this follow-up still has its heart in the right place. While I can’t call this sequel anything close to incredible I still think it’s worth seeing, this animated action extravaganza a visually pleasing joy that thanks in large part to the Parrs and the Parrs alone is awfully difficult to resist.